The Mama's Family TV show was a 30 minute comedy series that aired on NBC for its first two seasons and in syndication for another four. It was about an old woman who did love her family, but due to her cantankerous ways, she seldom showed it. She disapproved of just about everything her children did and their treatment was nothing compared to that she gave to her daughter-in-law! The only person who was usually safe from her scoldings was her grandson who she adored. Everyone else though had to watch their every move around Mama! 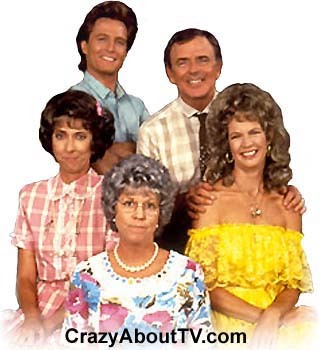 The Mama's Family TV show was a "spin-off" series of the "Carol Burnett Show". Mama's Family was an ongoing comedy sketch on that series that became one of the favorites. The main characters knew their parts well by the time Mama's Family premiered! Thelma Harper's husband, "Carl", was never seen. On the Carol Burnett Show, he was always in the bathroom and was sent off to heaven (that's anywhere away from Thelma) by the first episode of Mama's Family. Ellen also had a husband named Bruce who was never seen. All of the actors who played Vicki Lawrence's children were older than her by a minimum of 15 years! In fact, Vicki was 27 years younger than Betty White ("The Golden Girls", "Boston Legal")! Vinton Harper, despite his mentally-challenged and sometimes dorky ways, had been married once before his marriage to Naomi. His first wife's name was Mitzi. Naomi had two previous marriages. First to a guy named "Tommy Ray" and second to Leonard Oates. The Mama's Family TV show was canceled by NBC after the second season. Even though Carol Burnett left the show at that time, she and her husband Joe Hamilton who produced the show made TV history by making the Mama's Family TV show the first ever dramatic or comedy series to leave a network and run successfully in syndication (For FOUR more seasons)! In addition to Carol Burnett, Harvey Kormand and Rue McClanahan also left Mama's Family when it was canceled by NBC. Carol and Harvey's disappearance was explained by having them moved to Florida. Rue had supposedly choked to death on a toothpick! When Mama's Family reappeared in syndication, Vinton's children by his first marriage (Vinton "Buzz" Jr. and Sonja) were gone! No explanation was ever given for their disappearance! Then, near the end of the series, Vinton says that if he and Naomi have a baby boy, they will name it Vinton Jr.! The locale for Mama's Family was "Raytown". Vicki Lawrence wrote in her autobiography (and stated on the Mama's Family Reunion) that it was based on a small suburb of Kansas City (Raytown, Missouri). There was also a car with visible Missouri license plates in episode #24, "Mama Learns to Drive". Many businesses in town had the word "Ray" incorporated into their names. Among those were a restaurant ("Chez Ray"), KRAY (TV/Radio Station), So Far Ray Travel Agency, Lady Ray Fashions (at the GalaRAYa Mall), Ray of Hope Retirement Home, McRay's Burgers, Ray Cab, Rayhound Bus Lines, Rayland Ballroom, Raymada Inn, Raymart, and Rayvis Auto Rental, to name a few! Thank you for visiting our Mama's Family TV show page!